История оживает в Папуа-Новой Гвинее. national library and arhive of PNG ( Port Moresby) . Partnership . 20181114. On 14th of November 2018, the unique event was hold in the National Library of Papua New Guinee, which made the cooperation between citizens of our country in sphere of culture and education – the grand opening of the exhibition “Miklouho-Maclay. XXI century. 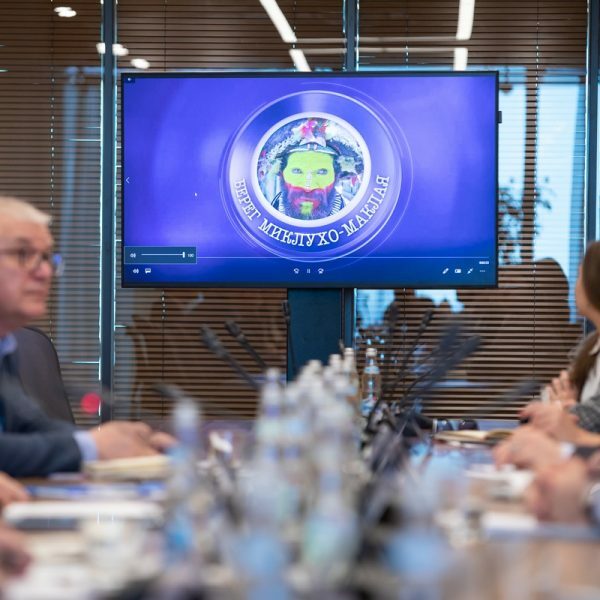 History revived”, which was prepared by Miklouho-Maclay Foundation for the Preservation of Ethnocultural Heritage with the support of Presidential grant Foundation of Russian federation and partners of Miklouho-Maclay Foundation. The opening was attended by representatives of the Russian delegation at the APEC Summit 2018. 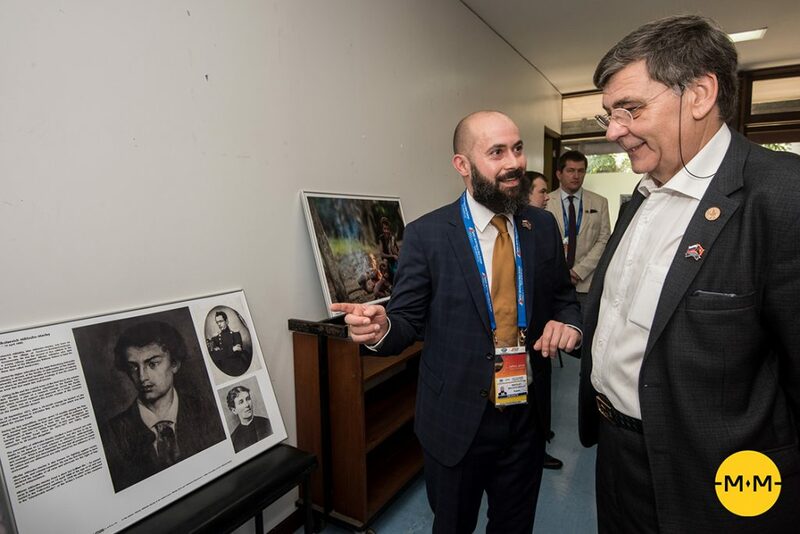 Guests were welcomed by Valery Sorokin, Ambassador at Large of the Russian Foreign Ministry, a senior official at the APEC Summit, who was pleasantly impressed by the exhibition he saw and noted that this is a great start of for the development of sustainable relations between our countries in the field of culture and education. Then Nickolay Miklouho-Maclay shared with the participants about his impressions and the significance of the project for him personally. He noted that the initiatives of his ancestor formed the basis of the projects which Miklouho-Maclay Foundation is currently engaged. Nickolay Miklouho-Maclay said that it is the people of Russia who know best about Papua New Guinea’s country in the world, thanks to the diaries of a scientist that millions of Russians read in their childhood. 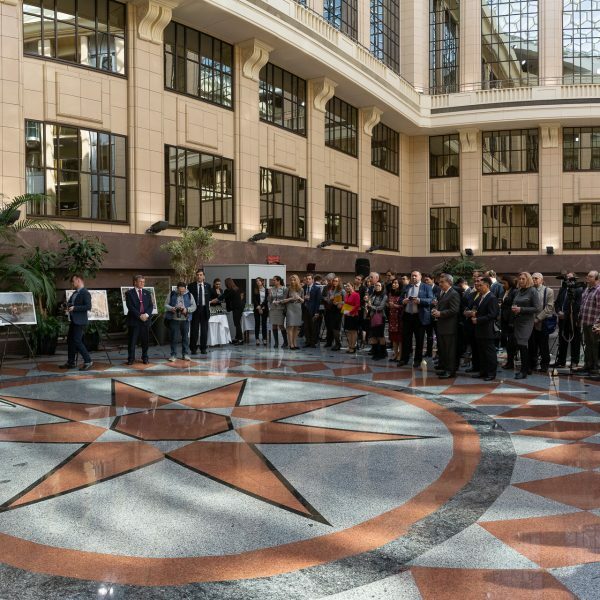 Interestingly, the opening was attended by a member of the delegation from Papua New Guinea Midelit Okole Pius, who returned from a trip to Russia, held from October 21 to 31, and organized by the Miklouho-Maclay Foundation with the support of the Russian Foreign Ministry and Rossotrudnichestvo and partners of the Fund. He was able to tell the audience about his visit to the Russian National Library in St. Petersburg, about books published in the language of Papua New Guinea residents stored in the Russian National Library archive and confirm their willingness to cooperate with the National Library of Papua New Guinea. 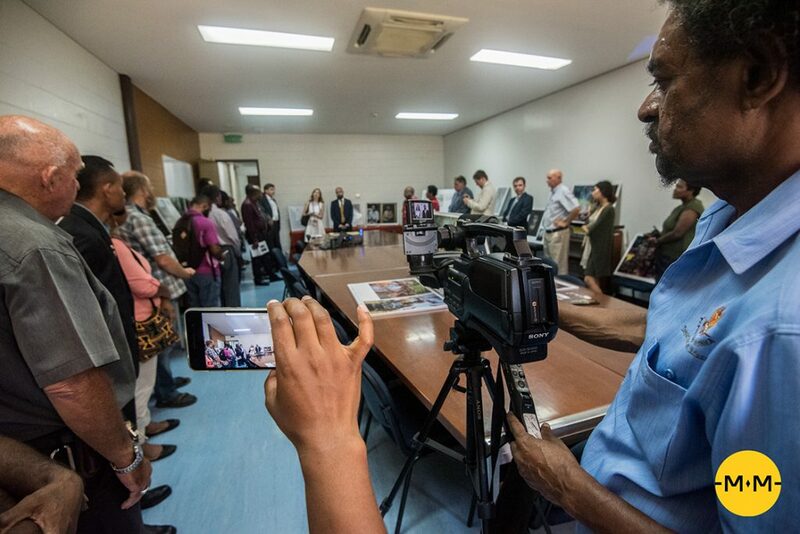 Participants of the opening could even see a brief overview of the visit to Russia by the Papuan Guineans. 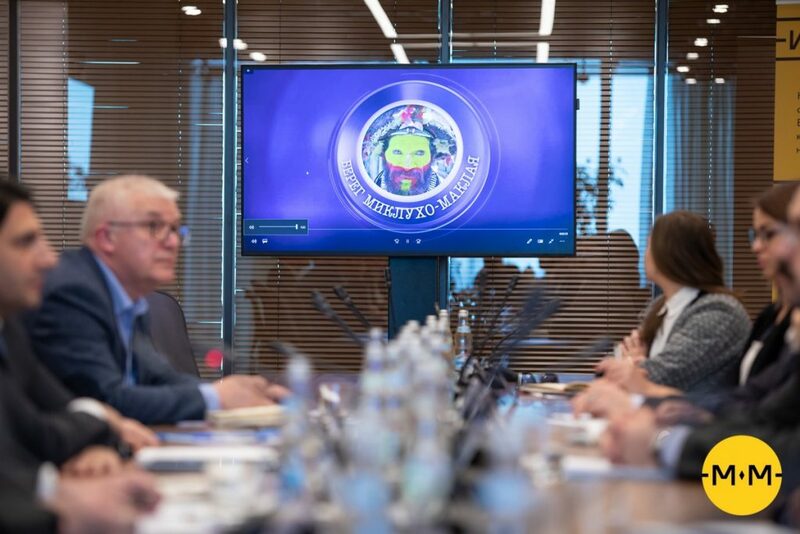 After the end of the official part, a two-minute video was shown, specially prepared for this meeting, and which left no one indifferent (https://www.youtube.com/watch?v=Huj5tp4cg-E). 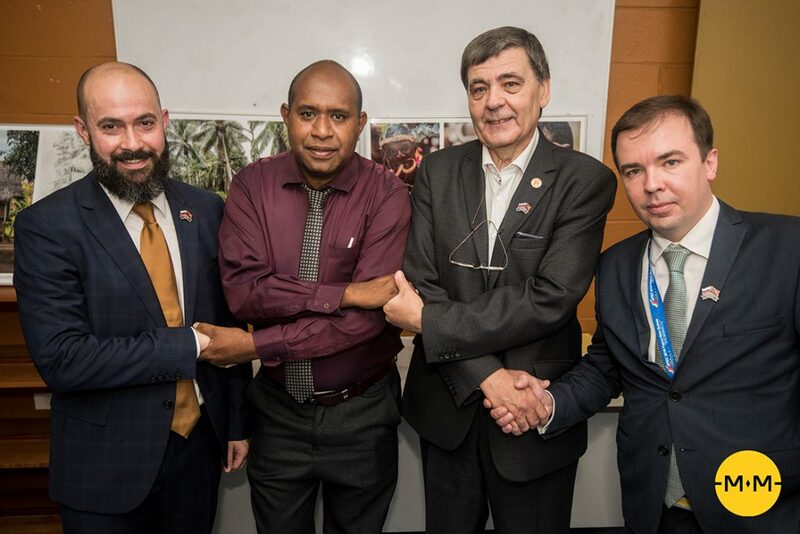 Kakaito Kasi, General Director of the National Library of Papua New Guinea spoke about plans to organize the “Corner of Russia” in the library, which was welcomed both by the Russian delegates and by the Papuan Guineans. The Director General appealed to the Miklouho-Maclay Foundation with an official letter on rendering assistance in interacting with state authorities of the Russian Federation for the creation, filling and maintenance of the “Corner of Russia”, since at the end of the meeting the parties decided to create it. 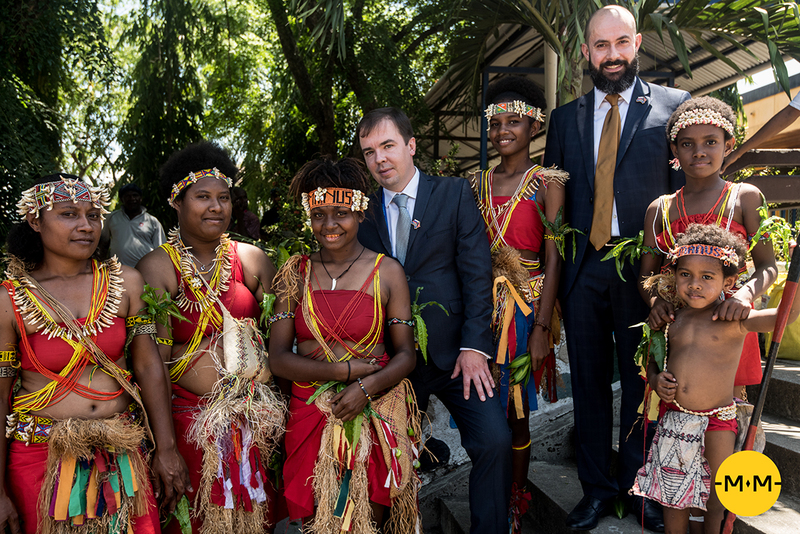 This will allow the people of Papua New Guinea to learn Russian culture, language and interact in the field of education. 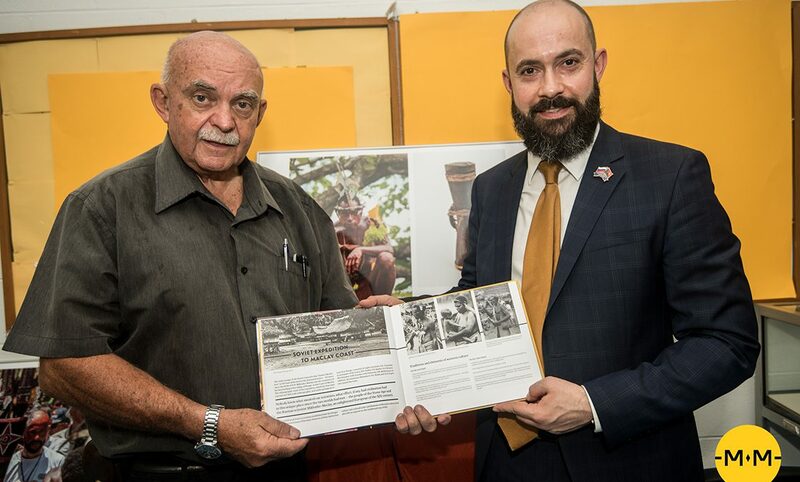 This initiative was an excellent basis for the presentation of the book — a special edition of “Journey to the Maclay Coast” authored by Nickolay Miklouho-Maclay, released in English by the Miklouho-Maclay Foundation in collaboration with the University of Papua New Guinea. 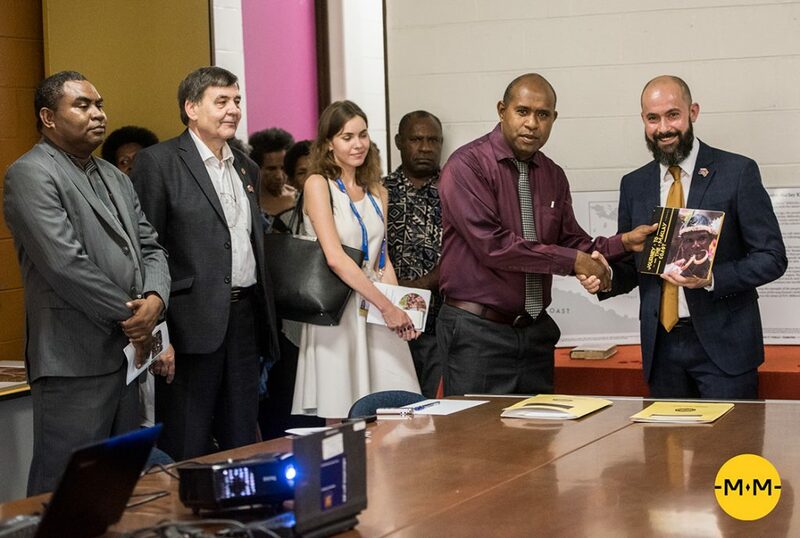 The representative of the University of Papua New Guinea — Joseph Palimi noted that this was a great event and an honor for the University to assist in the publication of the first edition of 100 copies. 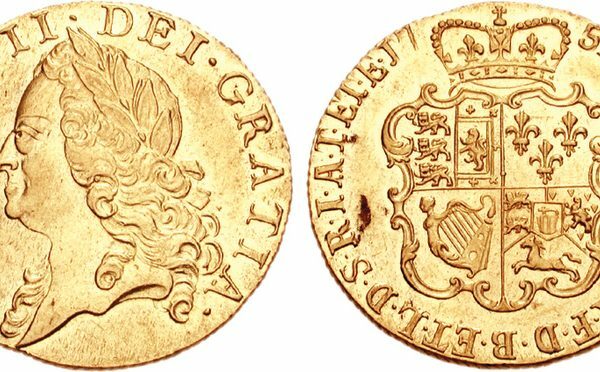 On this memorable gifts, which formed the basis of the “Corner of Russia”, did not end. The press service of the Ministry Foreign Affairs of Russia in the person of Alexey Dobryniskiy donated books about the history of Russia in Russian and English languages to the National Library of Papua New Guinea and the present was very welcome and accepted with pleasure. 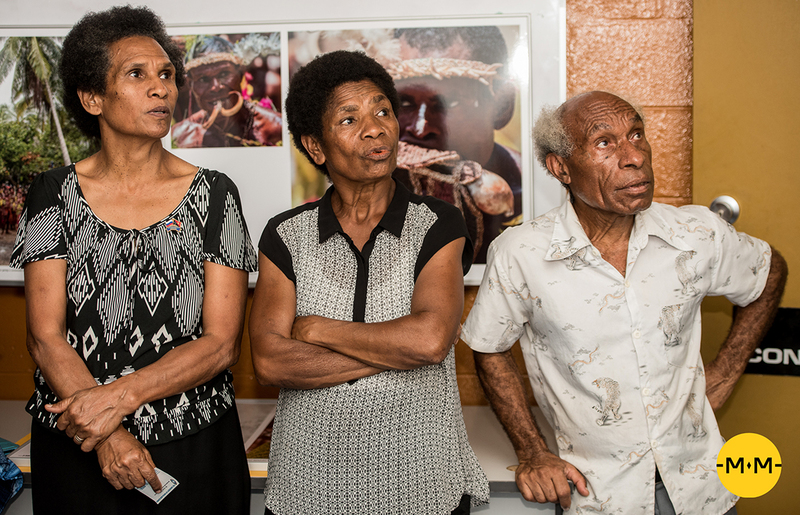 After the official, but no less pleasant part of the event, the premiere of the documentary film “The man from the Moon”, which tells about the great traveler and scientist Nickolay Miklouho-Maclay and Papua New Guinea, took place. According to the results of the film, the guests awarded with applause of the director Nickolay Miklouho-Maclay and noted the importance of our compatriot in the history of his country. 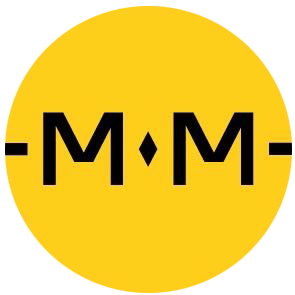 Miklouho-Maclay Foundation officially donated the National Library and the National University of Papua New Guinea the right to broadcast and distribute the documentary films “The man from the Moon” (36 min., https://www.youtube.com/watch?v=rXLigQoiGLw) and “Citizen of the World” (6.5 min., https://www.youtube.com/watch?v=iMnjQR5JJ7Q) for educational purposes in Papua New Guinea. 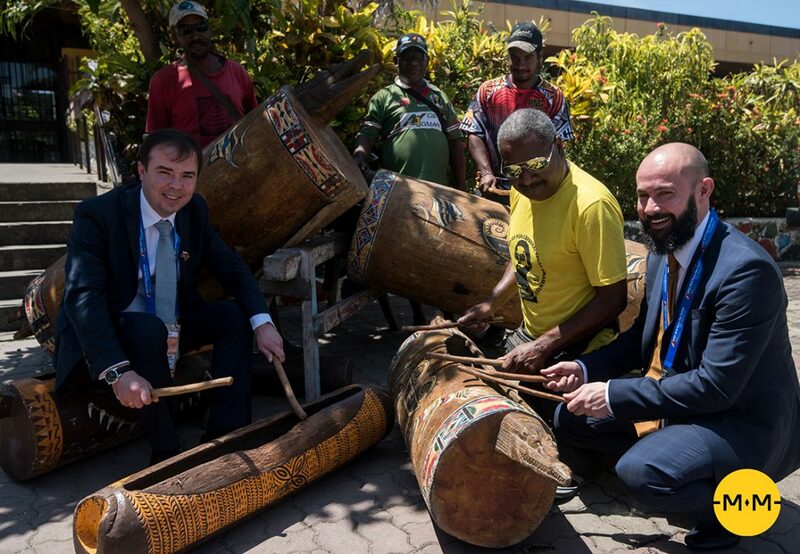 Thus, the past event has become an important part for building a bridge of friendship between the peoples of the Russian Federation and Papua New Guinea. This landmark event proved once again that our people are ready to closely cooperate and jointly develop cultural and educational projects in the territories of our countries. — transfer of the appeal of the National Library to assist in the organization of the “Corner of Russia” to Miklouho-Maclay Foundation.